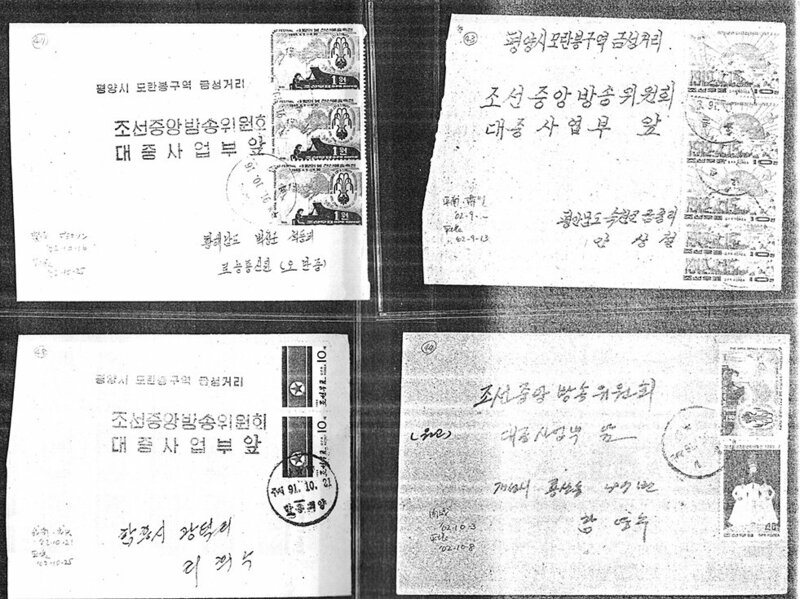 The North Korean Government performed a drastic monetary devaluation on July 1, 2002, having dramatic influence on both domestic and international postal rates. However, how major the changes were and when they became effective were not known until several months after the changes. The purpose of this article is to convey the information obtained from several sources by the author. 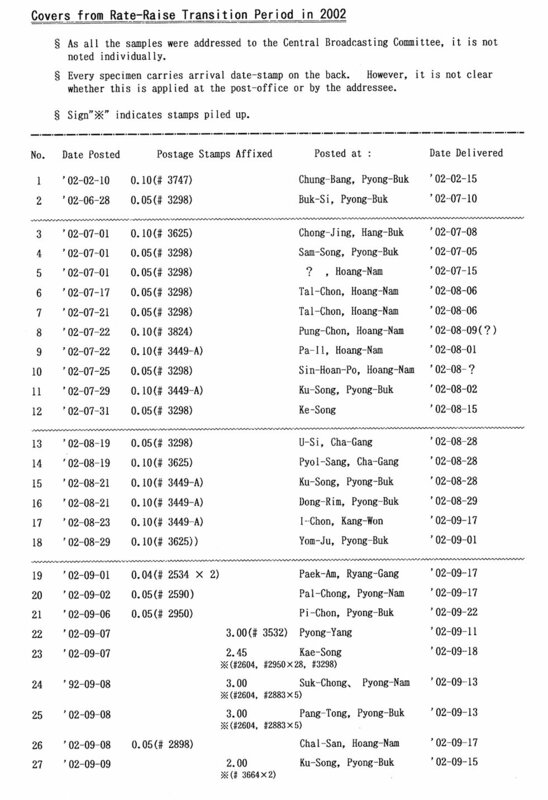 Although a new tariff table is not available as has been the case in the past, the author obtained 52 domestic covers mailed between February 10 and November 5 of 2002, details of which are found in Table 1. The following are major observations, and seem to be reasonable presumptions. 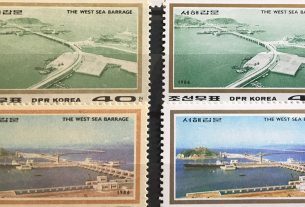 New rates were officially effective as of August 1 (DPRK Stamp Catalogue 1946-2002, p. 313), although penetration was relatively slow so that the earliest actual use noticed was sometime in early September, while the old rates continued for some time. 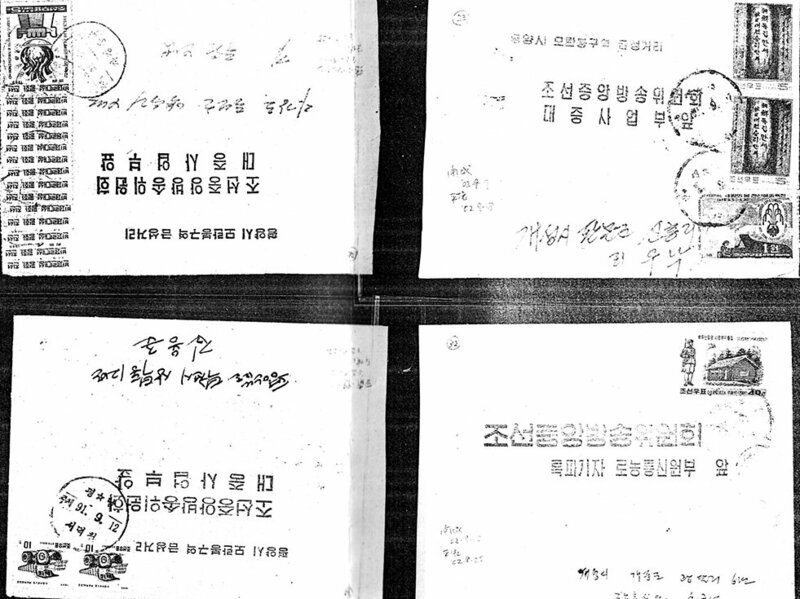 From the facts that the address is printed on almost 80% of these envelopes and that all of them are addressed to Korea Central Broadcasting Committee, it is safe to guess that they were all a kind of survey responses or questionnaires. 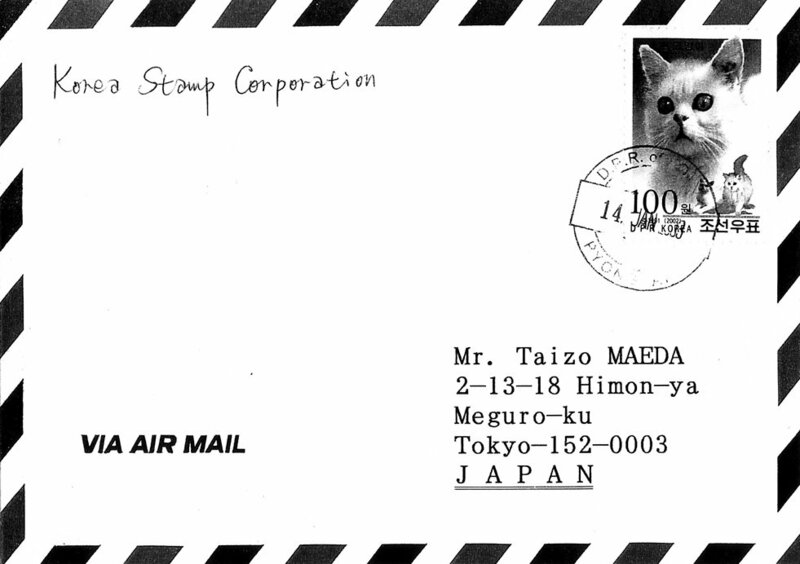 It is also noted that the senders are from around the nation, not limited to specific locations. 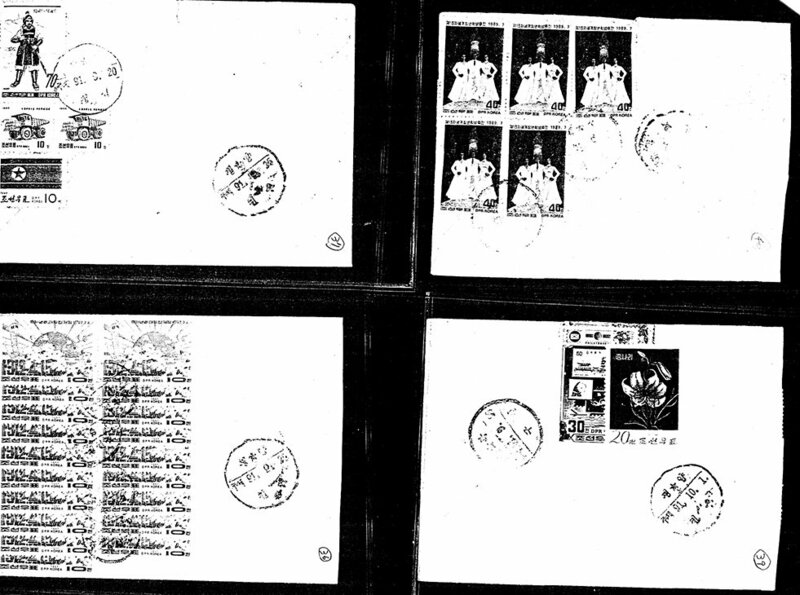 Printed matter, open-seal class or post card rate is 5 jong (old) or 2 won (new). 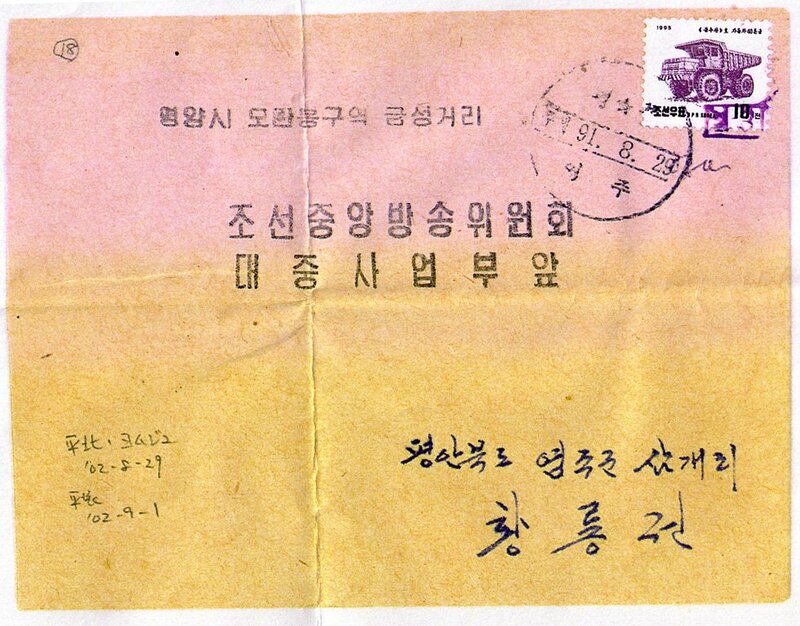 The sign of the open-seal mail is not clear in many cases as it is usually marked by the partial cutting on sealed end and, therefore, can not easily be confirmed after opening the envelope. Among those in this batch, only one cover showed prominent cut of a corner. They did not bother using “Fee Paid’ chop but stuck to pasting on the postage stamps; thus, piling up of the stamps in many occasions. Existence of quite a few covers as late as October 6 only with old rates which seemingly delivered with no special notices strongly suggests undesirable ignoring of very big fare jump among the senders and the negligence of due-collecting (or rejection of handling) among postal clerks. On the other hand, a few cases of strange values are noted, i.e., Nos. 23, 34, 40, and 49. They are paying short of 3.00 won but not exactly 2.00 won either. What these sums represent is entirely unclear. 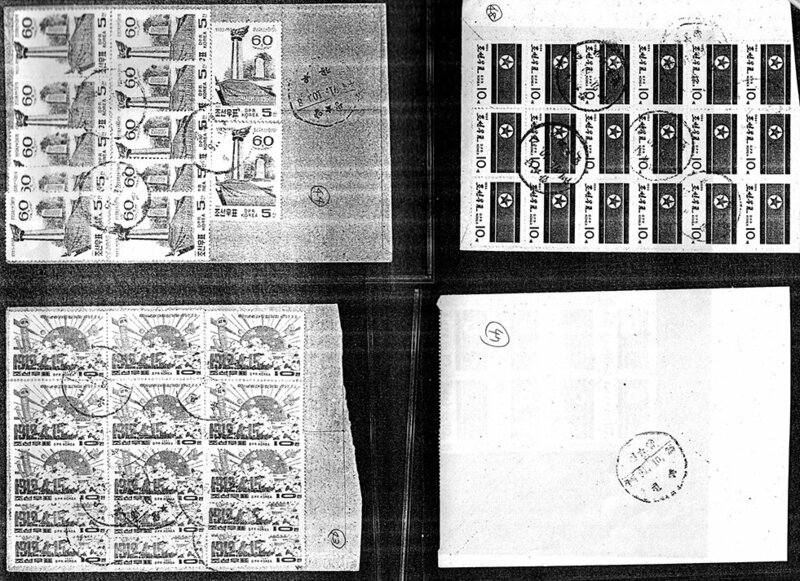 The next step is analyzing postage stamps used on these covers, details of which are found in Table 2. 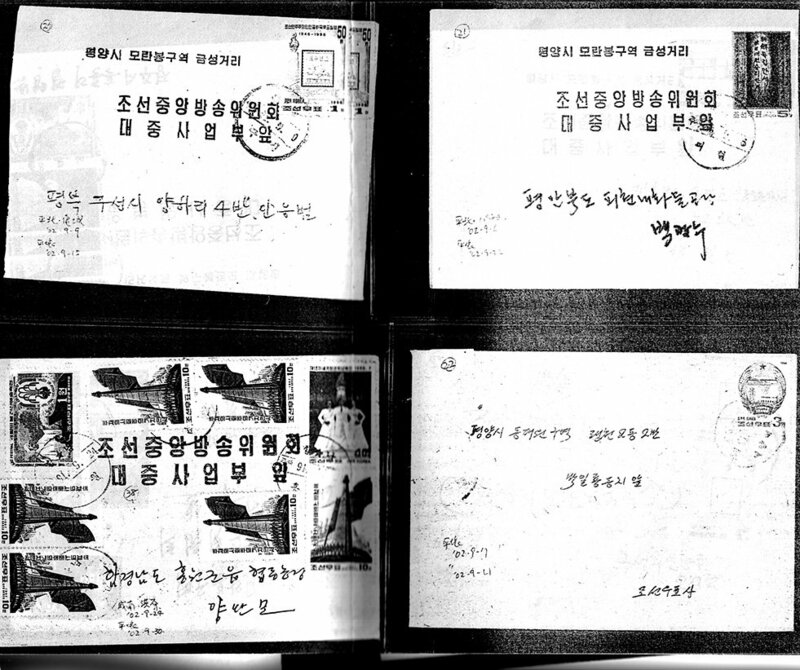 This table records the stamps by their North Korean catalogue numbers accompanied with Michel numbers for reference. 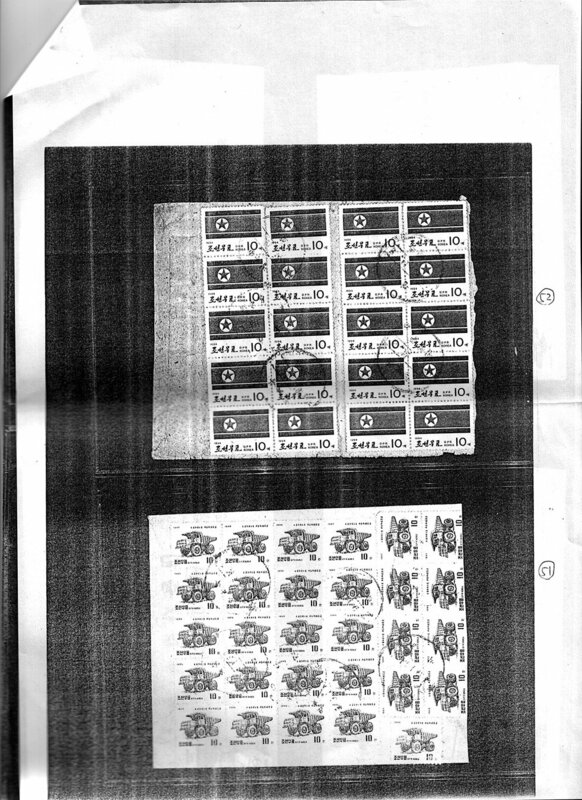 Each figure in this article shows the number of the stamp found on the cover. Numbers of the stamps used under old rates, new rates, and the total are given. 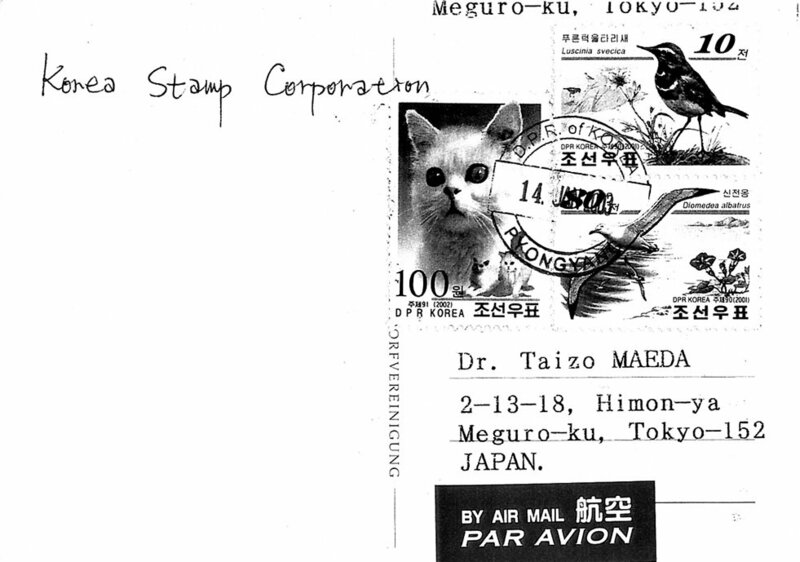 Multiple uses of low denomination stamps are abundant, as you would imagine. This makes a good contrast to only a few cases of won class denomination stamp usage. 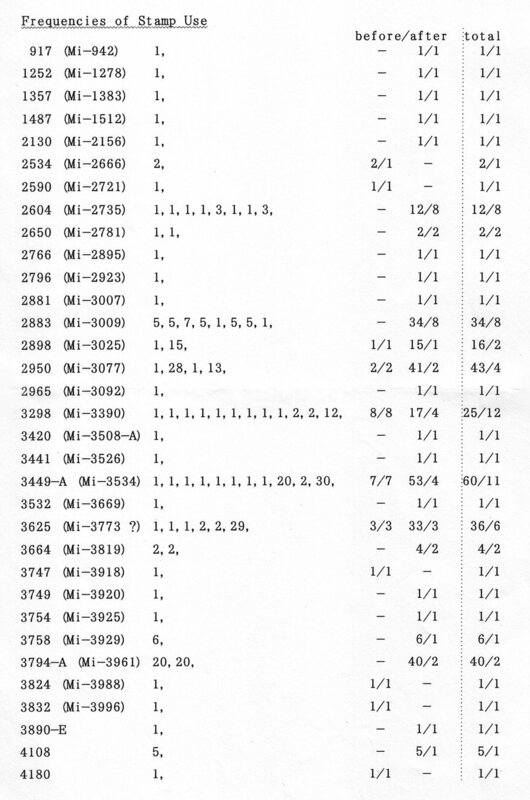 As examples of the latter, you can find covers #22, 27, 28, 33, 46, 47, and 50 (Table 1). 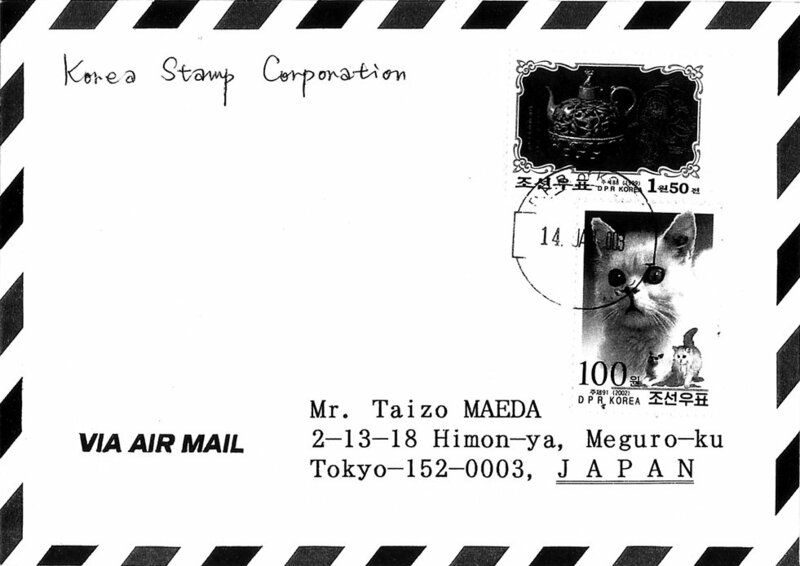 This can be interpreted as lack of demand for high denomination postage stamps among ordinary people in the past: registered, express, and/or international mail. 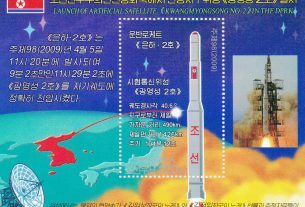 Also, seemingly, the use of high face value stamps is not limited to capital cities, such as Pyongyang and Wonsan. 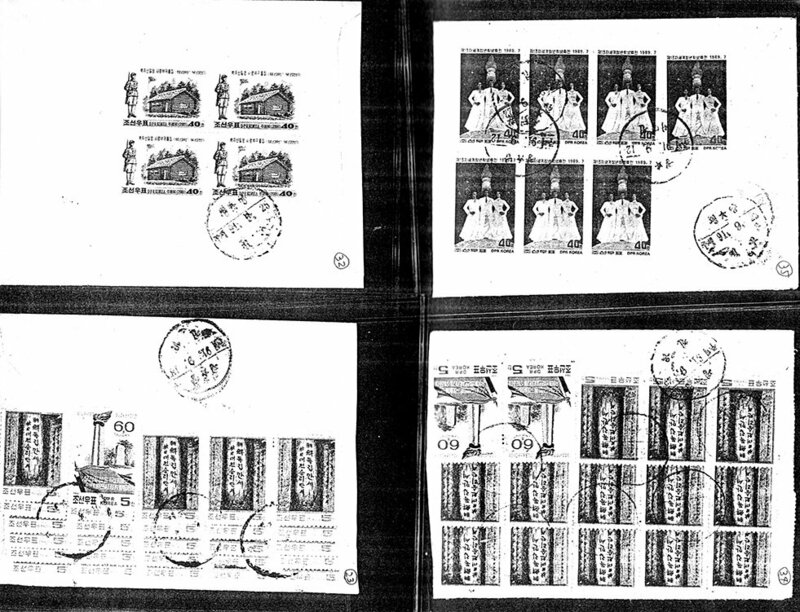 On new rate covers, as a total, 177 copies of 27 varieties of stamps were found. Among these, won class stamps were fairly scarce, as described above in point 1 with 20 copies of five varieties, while the 5 jon stamp consisted of 73 copies of three varieties, the 10 jon stamp accounted for 137 copies with nine varieties, and others. The most frequent appearance was with #3449A, the nation’s flag, 10 jon with 53 copies, followed by #2950, 5 jon, slogan-bearing tree and the sun’s day, 40 copies. 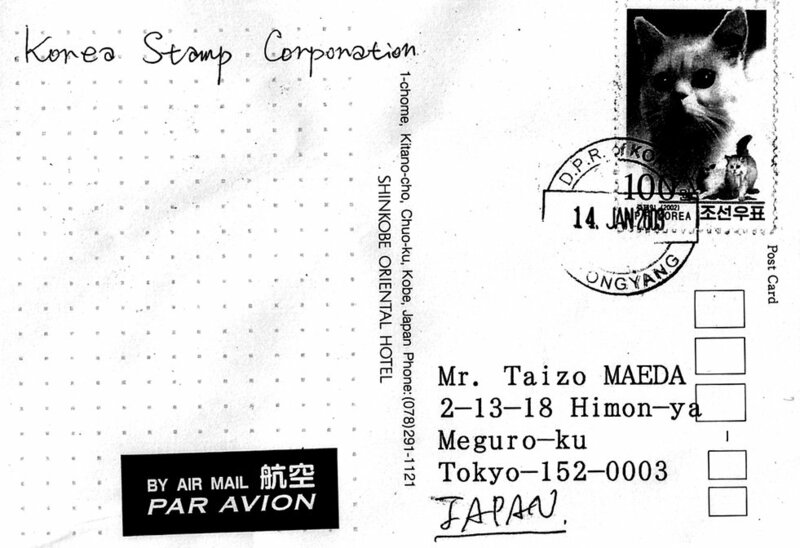 Stamp #3794A is an exception in that it is printed totally on white finished paper. 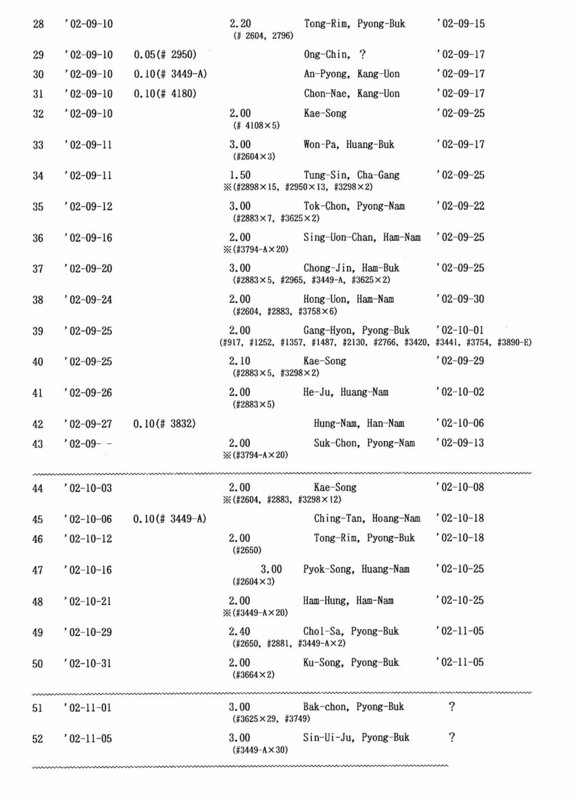 The complete frequency list is shown as Table 2. 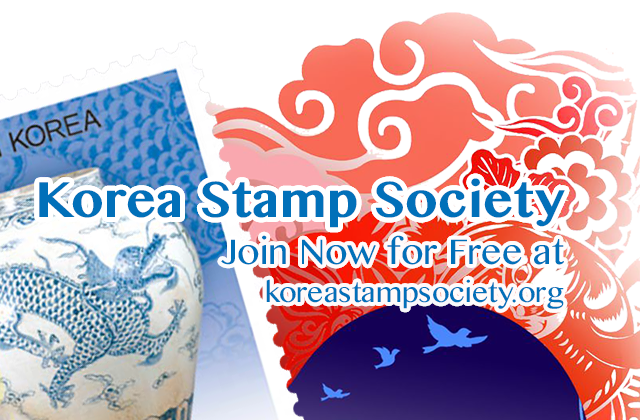 Most of these stamps are printed on less-bleached, off-white to light brown paper. Examples of these covers are shown below in Figure 1. 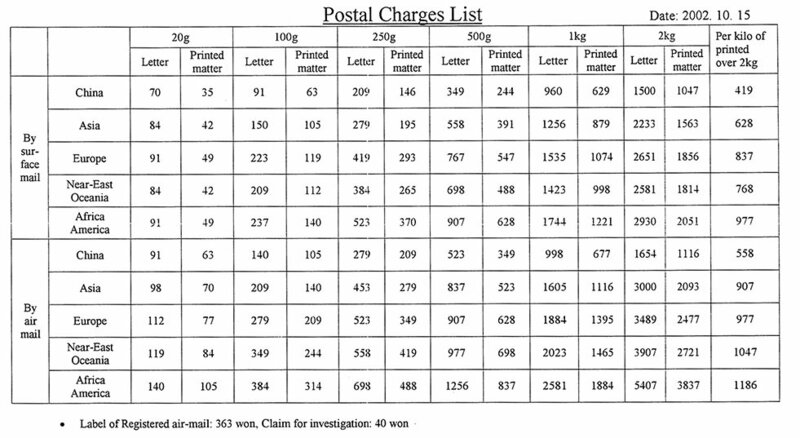 In early November, 2002, I was given a copy of a table, although partly blank, of the international postal charges. The table was filled in by the middle of December (Table 3). While domestic rates endured 30-fold increases, international rates suffered 70-fold increases. This difference was caused by the fact that the international mailing is a kind of foreign trade, while domestic mail is not and can be handled by each local government as it wishes. 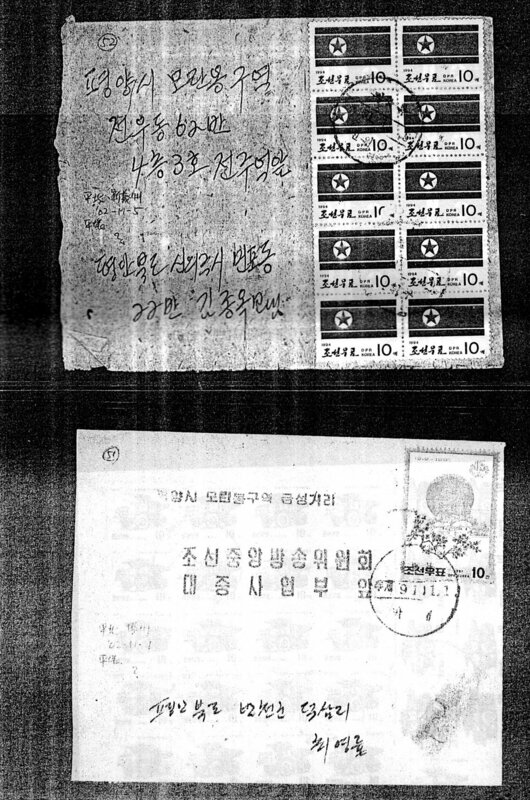 I would like to point out that this is almost economically prohibitive for ordinary citizens to communicate with foreign people when their monthly wages may be ordinarily 2,000 to 3,000 won under the new monetary system and sending a letter to a European country, for instance, one would need to sacrifice 3 to 5% of his/her income. 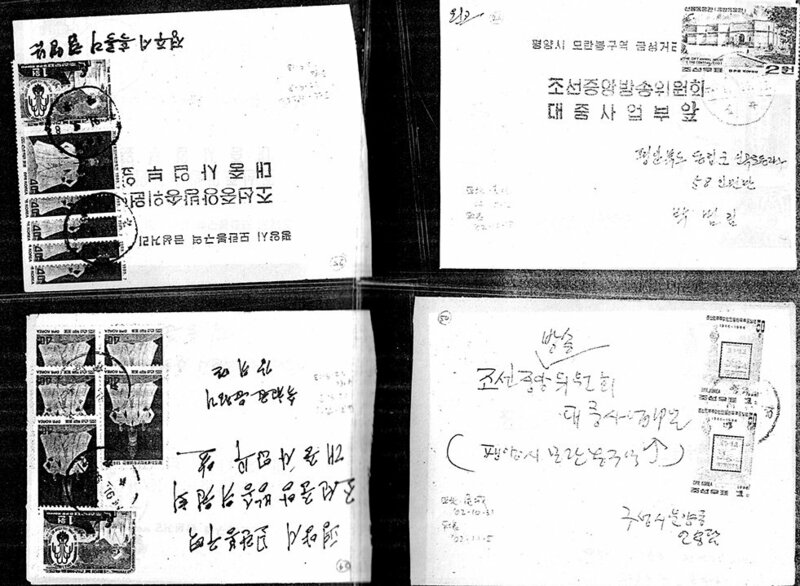 At the same time, I saw a few covers sent by some NK people to their acquaintances in Japan during April to October, 2002, but, because of their limited number, I could extract no clear tendencies. 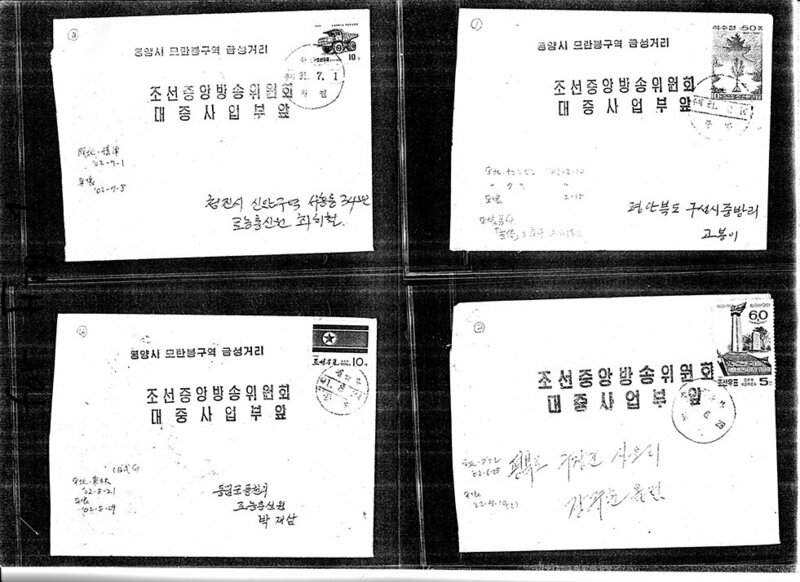 Later, in November and December of 2002, I requested Pyongyang people to post what I sent to them, envelopes and cards, affixed with no postage stamp or with old stamps, telling them that they would be compensated for whatever they used for postage. 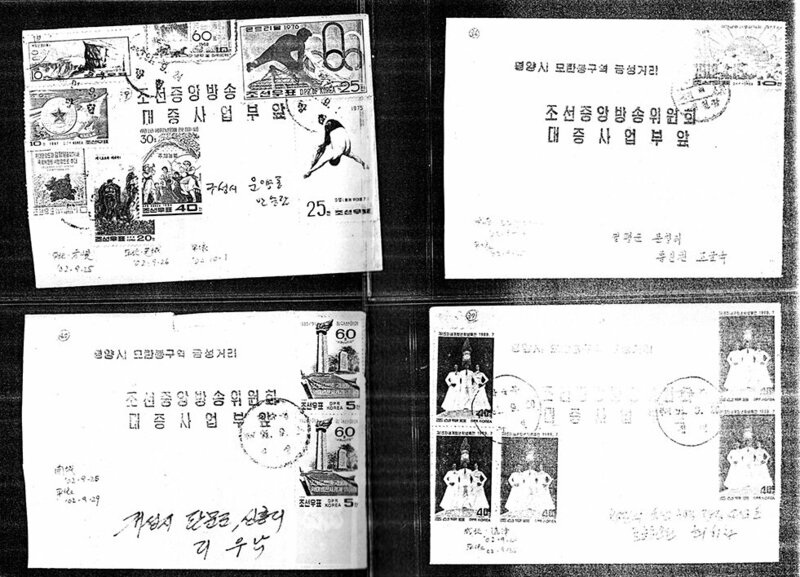 In the middle of January, 2003, I received all of them; attached to each was a single copy of #4218, Cat, 100 won stamp, regardless of envelope or card, previously affixed with old stamps or not, overpaying all of the items, as the postal rates were 98 won (letter) or 70 won (card?). A couple of pictures of this material are shown in Figure 2. 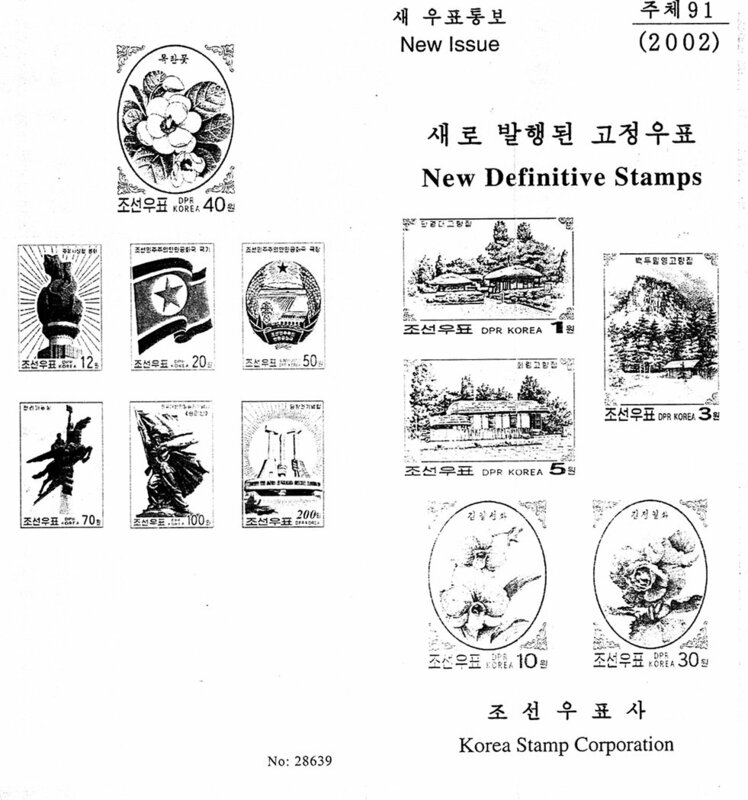 Substantially late after the monetary devaluation and postal rate changes, as of November 25, the NK Government issued an entirely new series of definitives, details of which are recorded in Figure 3. 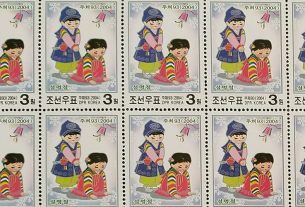 From this series, it can be learned that the 3 won value is for the basic domestic rate, and the 12 won is an express or a registration fee, while the postcard and printed matter/open-seal class mail also appear to be 3 won, according to the most recent New Year’s Greeting cards. This seems quite strange. Additionally, quantities issued are all the same, not taking into account in their printing volumes predictable demands that certainly differ from denomination to denomination. Strange! 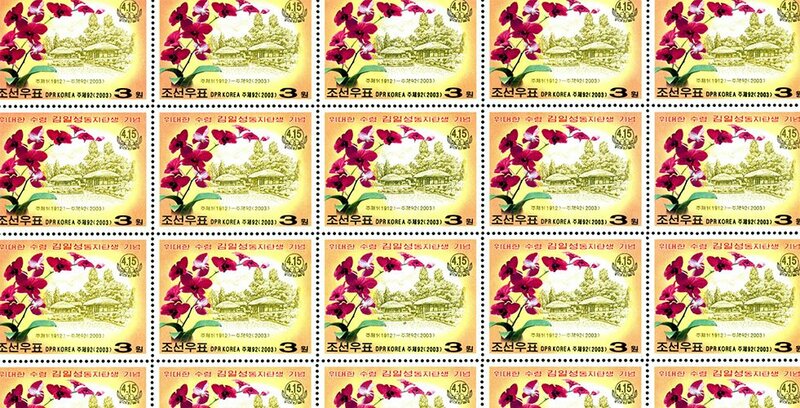 Further, the figure (30,000) is not big enough for people’s consumption AND collectors’ demands, not mentioning only 500 sets of imperforate stamps exclusively for collectors. 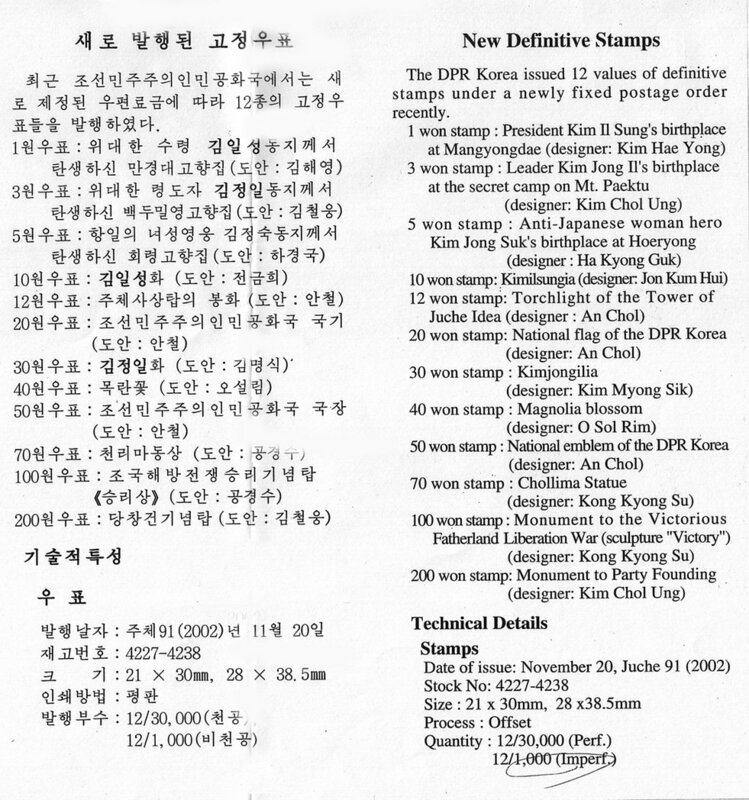 Going through these denominations above, it is clear that the people can use 3 and 12 won stamps for their domestic mail, while higher values of 75 won or more are presumably for international use. However, none of these denominations fit well the various postal rates disclosed in Table 3, which are quite random figures and do not end with 0 or 5. 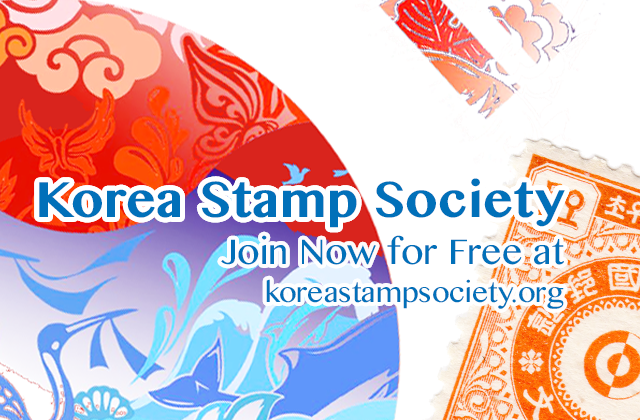 This article was originally published in Korean Philately Vol. 49 No. 4 (November 2003). If you have any new information please leave a remark below this article and we will get back to you.